Spurred by a bequest from the oil painter KURODA Seiki, the Institute located the Kuroda Memorial Hall to highlight his achievements. 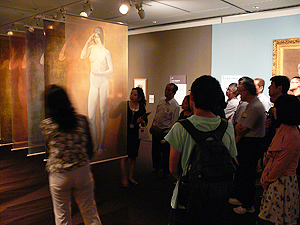 The Hall displays KURODA’s masterpieces works, such as Lakeside and Wisdom, Impression, Sentiment. An exhibit entitled “A Master of Modern Japanese Oil Painting: The KURODA Seiki Exhibit” has been shown once a year since 1977 at art museums around the country. In 2007, KURODA’s works were transferred to the Tokyo National Museum. Since then, the Tokyo National Museum and Our Institute have jointly organized a traveling exhibition of his works. This year marks the 90th anniversary of KURODA’s death, so the exhibit was shown in Kyoto, which was occasionally the setting for KURODA’s works like Maiko and Talk on Ancient Romance. 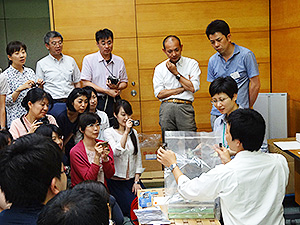 The exhibition took place at the Museum of Kyoto from June 7 to July 21. In addition to KURODA’s works such as Lakeside and Wisdom, Impression, Sentiment, the exhibit featured an installation with images from an optical study that was conducted at the Institute. 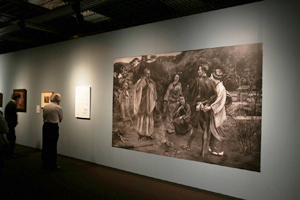 The massive work Talk on Ancient Romance was destroyed during the war, but a life-sized image (189×307 cm) of the work was created based on surviving photographic plates in the Institute’s collection. This image was shown at the exhibit, providing an opportunity to again appreciate the size of the work. 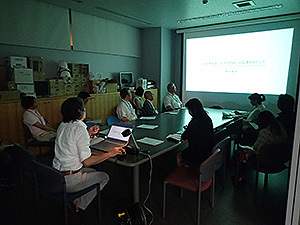 On June 7, the day that the exhibit opened, SHIOYA Jun delivered a special lecture on “KURODA Seiki and Modern Art in Japan.” On June 21, UEDA Sayoko, a curator at the Museum of Kyoto delivered a lecture entitled “What did KURODA Seiki see in Kyoto?” based on the results of the latest research. 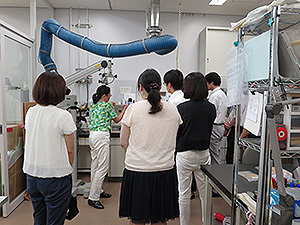 On June 20, students from the Music Department of the Kyoto City University of the Arts put on a concert of French music, which was fitting since KURODA studied in France. 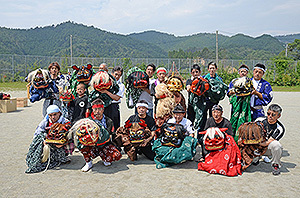 Such events delighted a number of guests. The exhibition was warmly received before it concluded, with attendance of close to 40,000 visitors. This figure clearly surpassed the usual number of visitors to the traveling exhibition. The Kuroda Memorial Hall that normally shows KURODA’s works is undergoing renovation. Once the Hall re-opens on January 2, 2015, the traveling exhibition that took place each year will end with the exhibition in Kyoto. In addition to Lakeside and Wisdom, Impression, Sentiment, other works by KURODA such as Woman Reading and Maiko will be displayed in the special room. The Hall will be open on additional days so that more visitors can appreciate KURODA’s works in Ueno. 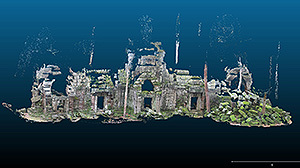 A 3D photogrammetry of the Ta Nei Temple was conducted with staff of the Authority for the Protection and Management of Angkor and the Region of Siem Reap (ASPARA Authority) from July 21 to 30. The survey was conducted as part of joint research and collaboration with the ASPARA Authority, which is responsible for conserving and managing the Angkor Complex. The goal of the joint research and collaboration is to establish a way to provide an elevation view and document scattered stones around the site based on a 3D photographic survey. This technical support will facilitate basic documentation of theTa Nei Temple, which the ASPARA Authority plans to start conserving over the next few years. 3D survey techniques are constantly advancing. The current survey attempted a technique known as Structure from Motion (SfM). This technique is noteworthy since it is relatively simple and does not require expensive equipment or software. The site is extensively photographed with a simple camera, like that found in a smartphone, and the image data are processed using open-source software, yielding a 3D model of the site. A model is obtained after a series of steps and its precision has to be further verified, but its level is sufficient to allow its use as basic data. In the future, several problems will still need to be resolved in order for the resulting model to be put to practical use as Cambodian management staff use this technique to document the entire temple. Developing countries like Cambodia have difficulty arranging special budgets and equipment for site conservation, but SfM should emerge as a way for local staff to document the state of a site as part of their everyday operations.